With years of industrial experience, we are presenting a qualitative collection of Almond Sorting Machine. Our proficient professionals manufacture this sorting machine by using the best quality components and sophisticated technology in line with industry norms. Our quality experts test this sorting machine on different quality measures so as to maintain its quality. Used for the cleaning of nuts, this sorting machine is highly appreciated in the market owing to its varied quality measures. Owing to our expertise in this domain, we are engaged in offering a distinguished range of Badam Sorting Machine. Our offered sorting machine is used to sort cashew, almond, peanut, kismis and tea as per the needs of our clients. 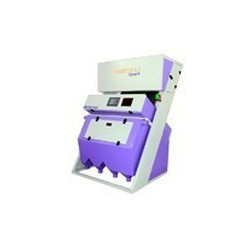 The provided sorting machine is manufactured using superior quality components and the latest technology in compliance with industry norms. Apart from this, we deliver this sorting machine after testing it against varied parameters. Looking for Almond Sorting Machine ?